Halloween is an exciting holiday for the kids. They love trying out different costumes and going trick-o’-treating in their neighborhood. Costumes, decorations, music, and candies are the highlights of this holiday! However, the same may become overwhelming, and at times challenging experience for children, who are on the autism spectrum. Unfamiliar people, places, social interactions and even some of the costumes could cause anxiety and sensory overload for the children. But careful preparation and planning can help turn this into a memorable Halloween! Here are some ideas to help you and your child enjoy the day. Create a visual story of what Halloween may be like for your child, with some pictures or drawings. This will help your child prepare for the day’s activities. Try on costumes before Halloween or let your child pick their favorite costume. If the costume is uncomfortable or doesn’t fit right, it may cause unnecessary distress and ruin their fun. Consider a Halloween costume that fits over your child’s regular clothes. Have them wear it for short periods of time and at increasing intervals over time. Practice going to a neighbor’s door with your child, ringing the bell or knocking on the door and receiving candy. Understand the comfort zone of your child and plan accordingly. For instance, if your child is not comfortable trick-o’-treating, you can start by going to three houses. Assess how your child is doing and build up to more houses the following year. Partner with family and friends that your child likes. Take your child to an activity in an already familiar community, such as a school festival or a neighborhood party where the child is comfortable and knows the people around. 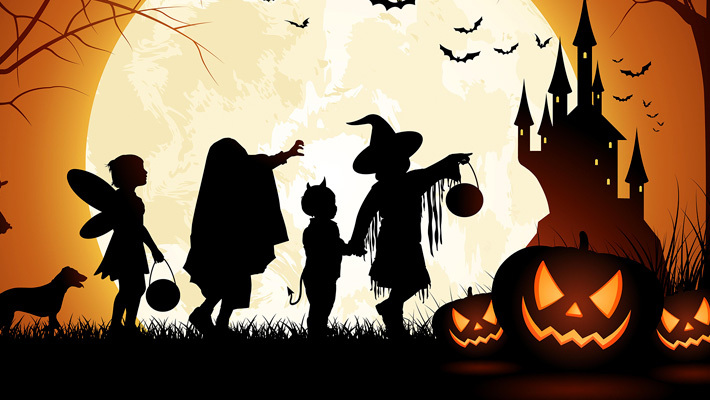 If your child is afraid of going out at night, plan Halloween activities that can be enjoyed indoors or during the daytime.